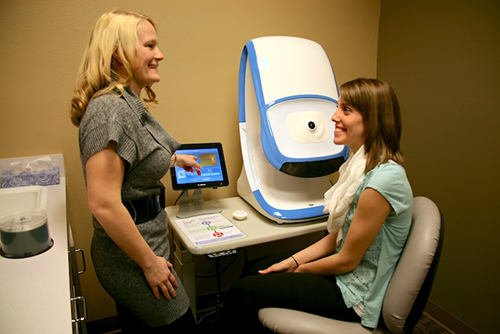 At Tigard Vision Center, we are pleased to offer a wide range of optometry services for our community! Our experienced optometrists can provide you with thorough eye evaluations, determine if you need corrective lenses and your exact prescription strength, fit you with the appropriate specialty eyewear, and help you pick out the most flattering pair of glasses for your face shape and skin tone. Want to learn more about what goes into our Comprehensive Eye Exams? Click the button! Comprehensive Eye Health and Vision Exams for patients of all ages; the American Optometric Association recommends that children have their first eye exam between 6 and 12 months of age. Our doctors participate in the InfantSEE program. Through InfantSEE, our optometrists will provide a one-time, comprehensive eye assessment for infants in their first year of life, offering early detection of potential eye and vision problems at no cost. This is a critical time for eye and vision development, and our optometrists have the experience, as well as, the instruments and resources to provide the most effective primary eye and vision services to infants. Medical Eye Exams for patients with previously diagnosed eye or general health conditions known to affect the eyes – glaucoma, macular degeneration, dry eye, diabetes, hypertension, etc. Contact Lens Fitting, Evaluation & Insertion Training. Emergency Eye Exams for eye infections, eye injuries, sudden changes to vision, etc.